The territory of Iraq coincides largely with the drainage basins of the Dijla (Tigris) and Furat (Euphrates) rivers. Since antiquity this region has been called Mesopotamia, from the Greek for ‘Land between Two Rivers’. Over the centuries, many civilizations have controlled the region or exerted influence over it, among them the Sumerians, Babylonians, Assyrians, Persians, Arabs, and Turks. The economic basis for early Mesopotamian civilizations was farming, which was made possible by irrigation, and later also commerce, which was favoured by Mesopotamia’s position as a crossroads of trade. 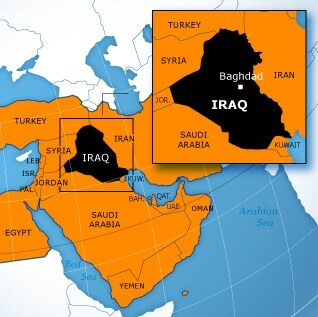 The Republic of Iraq is potentially a regional superpower, situated on the eastern flank of the Arab world. Potentially, as internal repression and military agression across the borders have brought Iraq on the verge of total collapse. The country is currently undergoing political and economic reconstruction, a long and difficult process.